All visiting New Delhi, the Capital, throng to India gate, illuminated every evening, from 19:00 to 21:30. 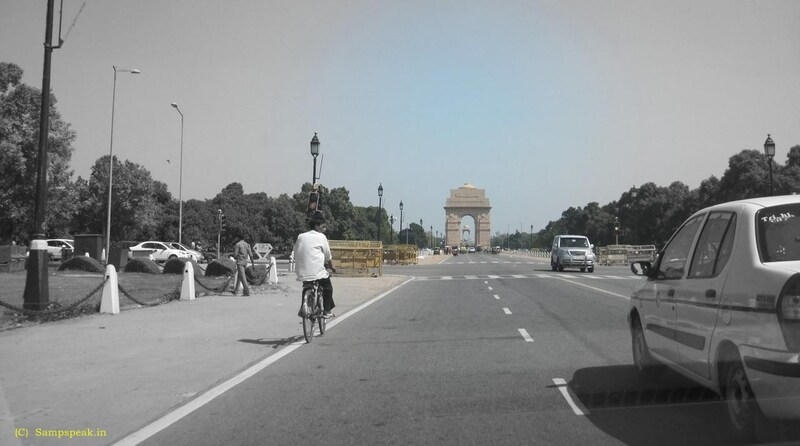 Sure most of us have watched Republic Day Parade starting from Rashtrapati Bhavan and passes around the India Gate. It it not merely a tourist spot ~ a place we all have to respect. The greatest day for all of us is 15th August ~ Indian Independence Day. Let us celebrate 70th Independence Day of the Nation in a grand manner. Independence was not achieved in a day ~ nor through a single enactment. The struggle and sacrifices encompass millions of activities right from 1757 spanning 190 years till 1947. Many names have been forgotten, many did not receive the honours their sacrifices deserve – may be due to doctored history. Now, as part of the Independence Day celebrations a week-long festival 'Bharat Parv', aimed to generate patriotic fervour, began at the Rajpath on Friday. Static bands of the Army, the Navy and the Air Force performed at the opening ceremony. Rajpath (meaning "King's Way") is a ceremonial boulevard in New Delhi, that runs from Rashtrapati Bhavan on Raisina Hill through Vijay Chowk and India Gate to National Stadium, Delhi. The avenue is lined on both sides by huge lawns, canals and rows of trees. Considered to be one of the most important roads in India, it is where the annual Republic Day parade takes place on 26th January. 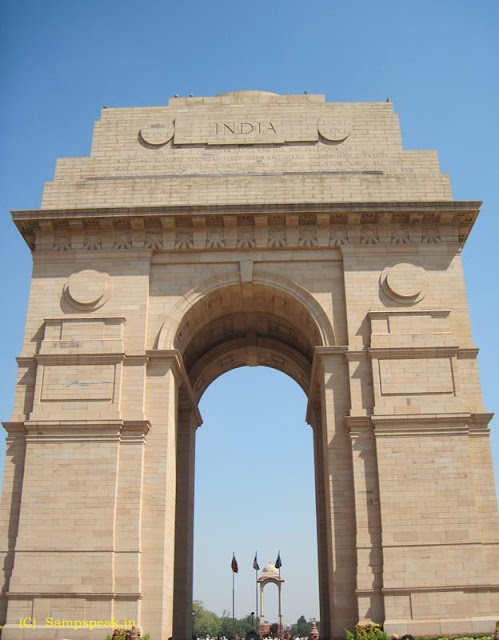 Across Rajpath in Central Delhi at the eastern end is laid a huge archway that is made of stone and is a pride that resembles victory. 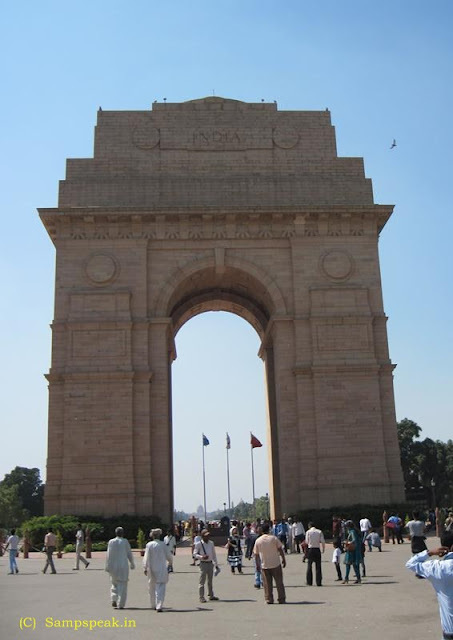 The monument is raised to a height of 42 meters and is formerly known as India Gate. It is not just a tourist sport ~ a war memorial, compared to the Arc de Triomphe in Paris. The India Gate was part of the work of the Imperial War Graves Commission(IWGC), which came into existence in December 1917 for building war graves and memorials to soldiers killed in the First World War. 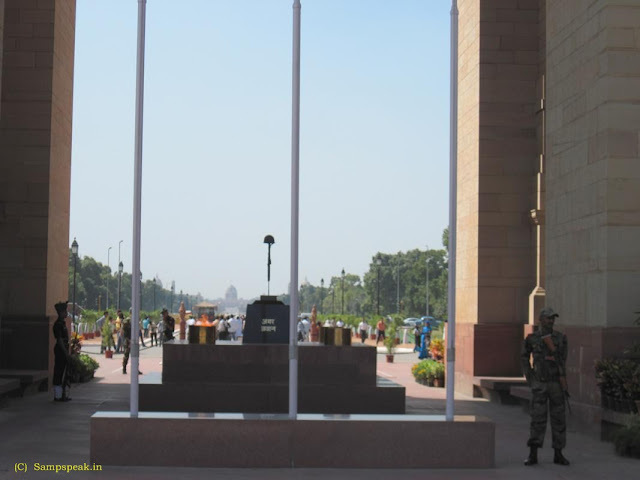 The foundation stone of the All-India War Memorial was laid in Feb 1921 by the visiting Duke of Connaught in a solemn soldierly ceremony attended by Officers and Men of the Indian Army, Imperial Service Troops, the Commander in Chief, and Chelmsford, the viceroy. The King, in his message, read out by the Duke said "On this spot, in the central vista of the Capital of India, there will stand a Memorial Archway, designed to keep" in the thoughts of future generations "the glorious sacrifice of the officers and men of the Indian Army who fought and fell". 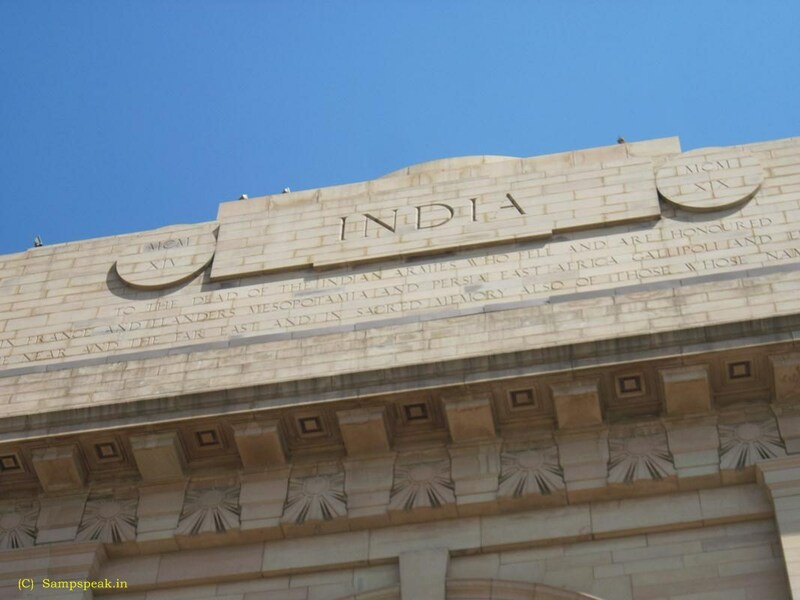 Ten years after the foundation stone laying ceremony, on February 12, 1931, the All India War Memorial was inaugurated by Viceroy Lord Irwin. In the decade between the laying of foundation stone of the War memorial and its inauguration, the rail-line was shifted to run along the Yamuna river, and the New Delhi Railway Station was opened in 1926. 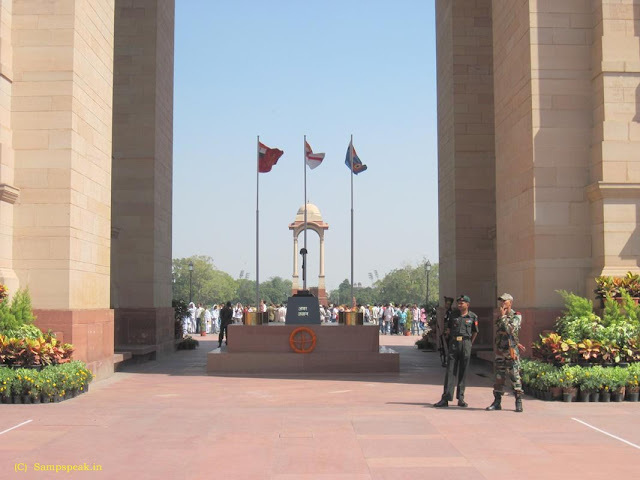 India Gate is a memorial to 82,000 soldiers of the undivided Indian Army who died in the period 1914–21 in the First World War, in France, Flanders, Mesopotamia, Persia, East Africa, Gallipoli and elsewhere in the Near and the Far East, and the Third Anglo-Afghan War. 13,300 servicemen's names, including some soldiers and officers from the United Kingdom, are inscribed on the gate. In 1971, following the Bangladesh Liberation war, a small simple structure, consisting of a black marble plinth, with reversed rifle, capped by war helmet, bounded by four eternal flames, was built beneath the soaring Memorial Archway. 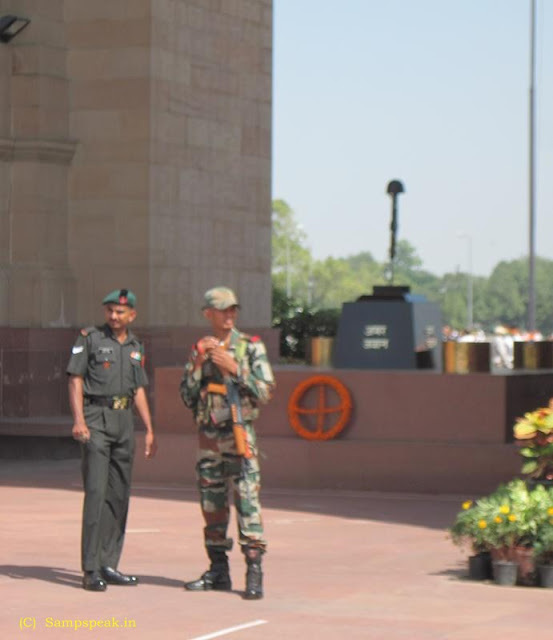 This structure, called Amar Jawan Jyoti, or the Flame of the Immortal Soldier, since 1971 has served as India's Tomb of the Unknown Soldier. The pillar along with whole monument representing the gate of India is built over the stone platform including Red Bharatpur stone along with the cornice elements alsoavailable. If you have a look at the monument, you will find that INDIA in bold letters is encrypted on either ends of the monument. You will also find the signs of XIX along with MCM. Throughout the walls of India Gate right from top to bottom are scripted the names of all those soldiers who have sacrificed their lives during the World War 1 as well as those of other names who have given their lives in Afghan war. Many of you for sure know these details ~ for the others, next time, you visit New Delhi, make it a point to go to this great place, stand silently before the arch, think of our valiant soldiers who protect our motherland with their sacrifices. Jai Hind. Jai Jawan, Bharat Mata ki Jai. Wow, this system is absolutely different and absolutely awesome, I do enjoy it. Now I have to grab all my power together and work hard on http://book-of-ra-deluxe-slot.com/ to get more money to buy extra bonuses to feel all advantages of the game process! Follow me, if you want the same!